They're all out of proportion. Lt Drebin: what an interesting photo which shows how cars have evolved : today's long wheelbases with small diameter wheels are what make them 'out of proportion' or ugly. Is this long wheelbase for aero or handling reasons? Anyone? 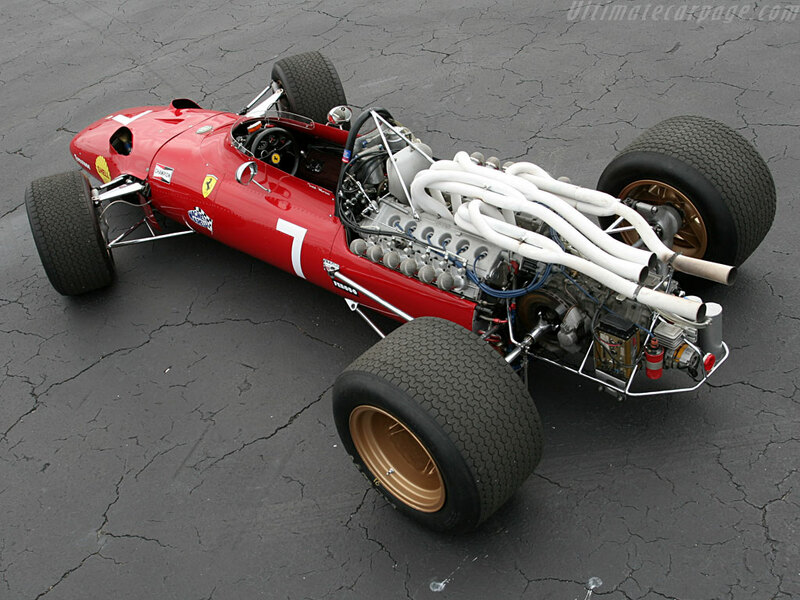 Quere: what a beautiful pic of that Ferrari V12. Like a steam locos of old, one could see and understand how it was made; and that sound!!! Some advantages to being born so long ago. Did they actually have DRS back in 1968. You can clearly see the cable & lever for adjusting the rear wing. It very much brings to mind the sometimes frantic and usually desperate blundering around for aerodynamic down fore devices amongst the Formula One teams in that summer of 1968. “Those drivers whose cars had ‘wings’, ‘spoilers’, ‘deflectors’, ‘straighteners’ or just bits of aluminium were busy altering, bending, twisting or tweaking them, in the way they used to play about with anti-roll bars or shock-absorber settings. Hulme took his ‘wing’ right off, but after a lap or two stopped and put it back, convinced of its value. Golly they were thrashing about back then and what an interesting contrast with today with large numbers of PhDs and large wind tunnels employed to penetrate the labyrinthine mysteries of the air as it passes over the surfaces of a racing car. 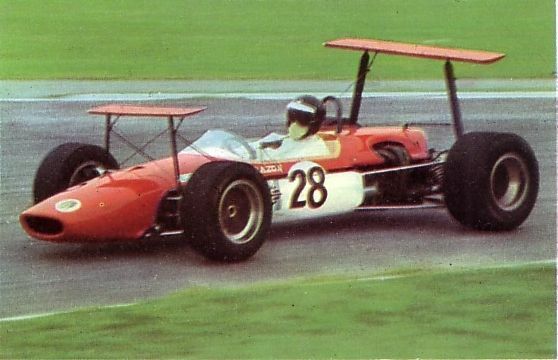 Elsewhere, I read that Ferrari’s pioneering F1 wing (if you discount the brothers May and Jim Hall from earlier) was imposing a mere 50lb downforce upon the car. Early days! Obie and quere are right, there was a lot of amateurish experimentation with those early wings in 1968. Surprisingly, Chapman's Lotus wings and supports were under-designed. The consequences showed in Spain on 4 May 1969 when Rindt and Hill crashed badly as their wings collapsed. 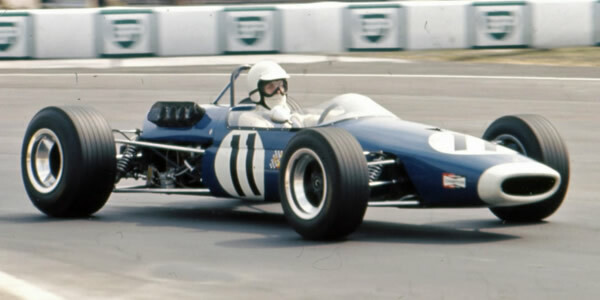 Rhodesian driver John Love had bought the ex-Clark Lotus-Cosworth 49 from 1967. This car was one of the original short wheelbase 49s, and not, as often erroneously reported, one of the later long wheelbase 49Bs. Love's competent tech team, based in Bulawayo, designed and made their own rear aerofoil, on sturdy struts which never broke. 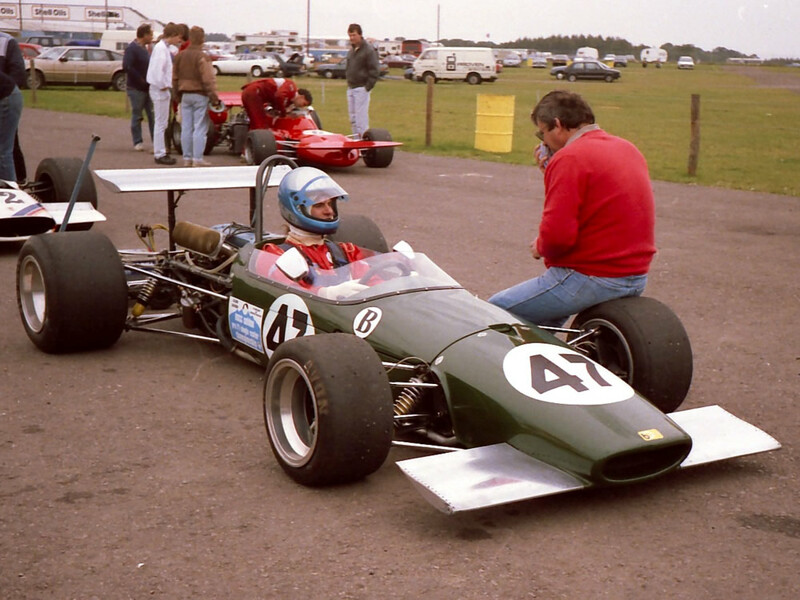 They had looked at the skimpy Lotus, Matra, and Brabham supports and shook their heads. Those skimpy toothpick struts had flap-adjusting levers too. They could not take any non-straight-on loads. Fortunately the tall-mounted wings were banned for the next race at Monaco on 18 May. Not much time! Is God willing to prevent evil, but not able? Then he is not omnipotent. Is he able, but not willing? Then he is malevolent. Is he both able and willing? Then whence cometh evil? Is he neither able nor willing? Then why call him God? Good spread of wings posted by Balibari. That monstrous bi-plane is incredible! 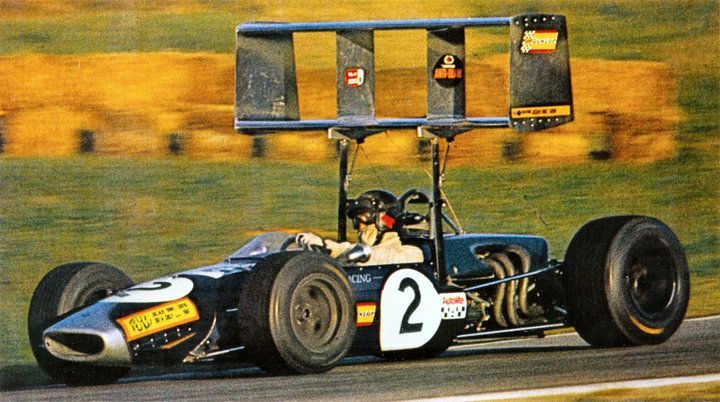 One pic shows the most scientifically-designed of all: the 711 March-Cosworth: that beautiful aero shape by Frank Costin was so clever, with the one-piece front wing raised above the body to get max aero effect. Set the trend. Yes, it's definitely for aerodynamic purposes. Toro Rosso have really been extending their cars in recent years, to make up for the lack of power, hence their very good performance in high speed cornering. I think with the Ferrari engine this year their car is now about 2.5m long. I guess Ron Dennis followed Jochen Rindt to Brabham then, from Cooper? Rindt's de facto manager was of course none other than one Bernard C. Ecclestone.. I forget about F1, but of course they did have it in Can-Am 1966 - on the Chaparral 2E. When it failed at Stardust (Las Vegas), you could see the wing flapping up and down on the straights. A fellow beta tester, from the recent 1966 Can-Am mod for GPL, has a great story about that car - seeing the wing being used in top level motor racing, he attached one to his slot* car and thus won races with wings before a winged car ever won a Grand Prix! F1 Fan for 78% of my life and counting! Last edited by rustyiesty on Tue Jul 26, 2016 12:55 am, edited 2 times in total. Thanks for the info that today's long wheelbases are for aero purposes, Rustyiesty. I was thought it was for handling, but airflow studies must prove this lwb is beneficial. In so many ways the Chaparral's were so far ahead of everyone: rear wing high-mounted, GM auto gearbox, then the one (2F?) 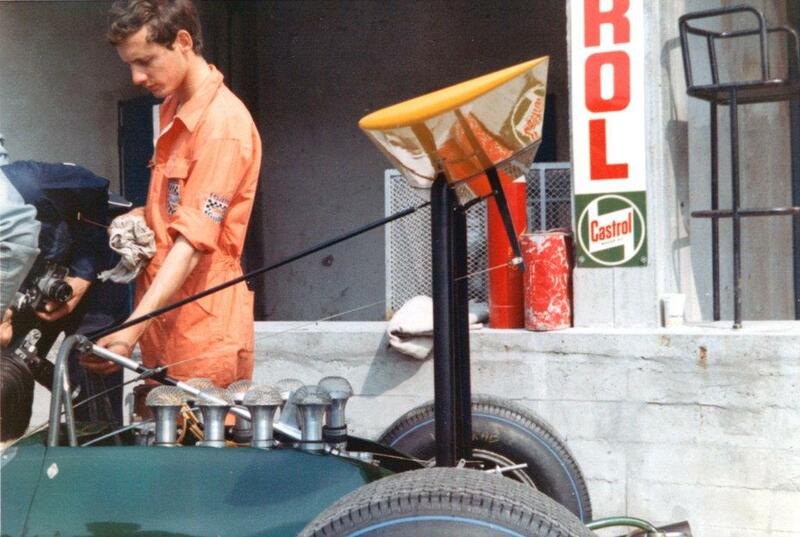 with the suction fans, ten years ahead of Murray's Brabham-Alfa Romeo. Did John Barnard work for Hall around this time? I think the Toro Rosso would be longer than 2.5 meters. Last edited by Ruste13 on Fri Apr 22, 2016 11:54 am, edited 1 time in total. I think the Toro Rosso would be longer than 2.5 maters. I might have halved that in my memory - longer than 5 metres stacks up, when looking at this list (from AMuS reporter Tobias Gruener) of 2016 specs: https://twitter.com/tgruener/status/709064252074676226. Note the slight wheelbase increases generally since 2015 (and Haas being identical to Ferrari!). I think this is also to handle the extreme torque of the hybrid engines, otherwise, indeed, a nimbler car would be more likely on a shorter wheelbase (e.g. the pre-winged 1967 Brabham-Repco). Notably, McLaren have also adapted the high rake angle of Red Bull, given they rehired former Red Bull aerodynamicist Peter Prodromou. His first contribution last year - the 'Red Bull' front wing that McLaren then brought as a mid-season update. True. McLaren designer Robin Herd had looked at wings for the McLaren M2B, but given their problems with the Mallite construction and sourcing a good engine, they put it on the back-burner: oh, what could have been! Seems Barnard started at Lola in 1968, and only designed the Chaparral 2K Indycar from 1979. It's surprising that the designers of the innovative 2 series are given less credit than they are surely due (perhaps through the dominant Eurocentric F1/GP movement). Rustyiesty: interesting that Barnard only started on Chaparrals in 1980s Indy racing. I remember him in an interview years ago saying how useful the Indy race/circuit was for an engineer: simple layout although each corner slightly different; he could try each set-up tweak at a time and notice direct results in time/sped of car. Barnard says he learnt all his basics at Indy in this way and then applied it all to F1 design. Which drivers would Barnard have worked with at Indy? Reason I asked about JB at Chaparral was that I've heard on the grapevine that Jim Hall took all credit for his cars and innovations, kept quiet about his engineers/team. I had the same attitude from two of Italy's great carrosserie when researching two car designers: the businessmen owners wanted all the credit even for drawing/design work! Recently read what Andretti said of Chris Amon: He was a lovely guy, we shared an apartment together in Modena (both raced for Ferrari in early seventies) and got along well. He was a fantastic driver. His luck was so bad that if he became an undertaker people would stop dying. Last edited by POBRatings on Wed Aug 03, 2016 2:12 pm, edited 1 time in total. thanks to the 9 victories in 1954-1955. And Frank Williams can show Ron how to save on coins by using a short piece of copper wire in the tel booth. That is interesting. Red Bull have done really well to score so highly, as a modern team against the likes of Ferrari and McLaren. Could you post a completer list please? Say top ten? The list tells me that it would take some 2 years, somewhere in 2018 for Mercedes to climb up one more place, provided that other teams struggle to keep up with them. If RBR will again become a candidate for victories, it could be earliest in 2017, and Mercedes realistically might have around 64-65 victories by then vs 51 by Red Bull. Not Formula One, but related in spirit: during the 1916 season in the USA during the American Grand Prize road race at Santa Monica, California, championship leader Dario Resta had to retire his leading Peugeot GP car with an electrical fault on lap 19 of 48. So desparate was Resta to win the Championship, that he ran to the Stutz pit, their car having taken the lead, and offered to buy it then and there at any price! the Stutz team refused, so Resta joined his wife and watched the rest of the race from the stands. Resta 's wife was the sister of rival driver Spencer Wishart, of ' the millionaire Californian family'. She had enabled Resta to buy the latest GP Peugeots from 1914-1916. Imagine Senna or Alonso l trying the same? Listen Frank, I'll pay you anything; or hey Toto, how about selling me Hamilton's drive? Hi Lt. DRebin: different times for sure, but imo the passion has never changed. What Resta did in 1916 is exactly what any of Alonso, Hamilton, Vettel would like to do today. It is only, as you say, the differing times that prevent this happening today: corporate image, social norms, media exposure, political correctness, etc. The burning passion of drivers, designers, managers, pit crew, etc has imo never changed thorughout GP-F1 racing history. Wow, different days indeed. I'd have loved to have been there to see the Stutz driver's reaction had the team accepted! Yeah, it would have been something to see. The Stutz driver was one of the top three or so drivers then, Earl Cooper, so he'd not have been amused, to put it mildly. Worse than Webber's reaction when he had his front wing given to Vettel? Or than Barrichello's inner feeling when having to move over for Schum in Austria? Perhaps it would have been like Jones when Reutemann refused to lose his lead in Brazil. Maybe Piquet punching and kicking Salazar at Monza would be closest? All hilarious for us fans. not involved. Senna punching Irvine in the face for having the cheek re-taking him exiting a corner (late 1993?). Mansell storming into Senna's pit to beat him up, after he reckoned Senna took him off, but being restrained by pit crew (Spa? 199?). Schumacher storming into Coulthard's pit at Spa after their rain-collision, to assualt DC but restrained by pit crew. Jean Behra, Ferrari driver in the late fifties Ferrari actually floored the team manager on the pit apron during practice. Fagioli in the Mercedes-Benz team during the thirties had an argument on the pit apron with team-mate Caracciola and threw a wheel hammer at him. Luckily it missed. Boxing or rugby may be safer sports? James Hunt having a rant at Collin Chapman after collision with Andretti at Zandvoort 1977, and with Jochen Mass in Mosport Park, Canada the same year, as well as in Monaco in his Hesketh days at Stuck, I think. Yes, that's practically already over there, his double match with Mass and marshal whom I forgot to mention, tough he did not attack physically Mass, unlike the poor marshal. Reading the thread on the 2016 McLaren-Honda and where its problem lies, reminded me of an amusing story of Stirling Moss back in 1954. Moss's team had bought Moss the latest Maserati 250F, run by expert mechanic Alf Francis. between races Francis would tow the car to Masearti in Modena for rebuilding. One time the factory passed on new parts that gave another 40 or so bhp. At his first practice Moss came into the pit fuming, saying Alf had ruined the handling. Alf denied this and told Stirling that a significant increase in engine power would naturally affect the car's handling. Moss was adamant that he could tell that something had been altered on the chassis. He even resorted to getting a tape measure, saying he was sure Alf had altered the wheelbase, and checking it! Of course Francis had done nothing to the chassis. Just putting that iconic picture of four outstanding drivers of the eighties. Source: Nigel Mansell official Facebook page. Excellent picture. I liked the alternative race suits of the Williams drivers that season, it is a shame nobody does that now. Why did Williams actually do that? Probably something related to the fact that Mansell had red colored number 5, and Piquet white colored number 6. Hilarious story from the 1953 Swiss Grand Prix. During practice privateer Rudi Fischer complained to the Ferrari team manager that his customer Ferrari Type 500 was too slow. The team manager got Hawthorn to try out Fischer's car. Hawthorn set a faster time than in his own team car. Another funny story: back in about 1991 McLaren announced their new roadgoing F1 car, and had the first example at the Japanese GP to do a few demo laps. Berger was going to drive, but at the last minute Ron Dennis could not resist and insisted on driving with Gerhard as passenger. Halfway round the lap Ron spins off and damages the valuable car. Berger as usual bursts out laughing. Back in the pits Gerhard slapped Ron on the back and said : "Never mind Ron, every F1 driver has an off-day!" Class war: back in the Thirties most drivers were from the upper economic classes. At Mercedes-Benz one of their mechanics was promoted to the GP team in 1935: Hermann Lang. Established team drivers Caracciola and Von Brauchitsch used to taunt him continually. Von B pointedly ordered ' red wine for Caracciola and me, and a beer for Lang.' Once in a hotel restaurant Von B came down and saw Lang and the crew having breakfast: "Oh I see you've learnt to use a knife and fork!" Others at the table had to hold Lang back from attacking Von B. On track however Lang became increasingly good and by 1938-39 was one of the fastest drivers of all. Despite the private pact between Caracc and Von B to keep Lang from winning, in 1938 and 1939 Lang won 6 races to Caracciola's 3 and Von B's 1. In 1939 Lang set 5 poles to Caracciola's 1 and Von B's 0. Just read some of Vettel's radio 'messages'. Hilarious and make Kimi's look so dull and conventional. In 2013 Malaysian GP Sebastian yelled to his pitcrew: "Mark is to slow, get him out of the way. He's too slow." If they'd had radio back in the day, can you imagine Fangio in 1950 saying of his team mate: "Nino 's (Farina) too slow, get him out of the way." Or Clark about Spence; Stewart about Cevert. Posting on another thread about rookie Irvine daring to overtake Senna, and getting punched in the face for it, reminded me of an even funnier overtake. Back in 1937 two of the 6.0-litre, V16 supercharged Auto-Unions raced in South Africa. The races were handicap events, so Rosemeyer had to drive at the limit all the time. The fields included all sorts of cars, Rileys, ERAs, MG, Ford- and Hudson-engined specials, down to Austin Seven specials. One Austin Seven was a 1931 Brooklands type, with aero-styled single-seater bought direct from Austin for local driver Douggie van Riet to race. Douggie modified the engine, brakes and chassis and was very successful in the SA handicap races. He told of the 1937 Grosvenor GP in Cape Town, how Rosemeyer passed him on the long downhill straight, but at the hairpin, the light weight of the Austin meant shorter braking distances. He closed and passed Rosememeye on the turn, and looked back on exiting and saw the look of surprise on Rosemeyer's face! Of course the Auto-Uinion repassed within 100 metres. Unlike Senna, Rosemeyer did not attack Van Riet in the pits. If they'd had radio back in the day, can you imagine Fangio in 1950 saying of his team mate: "Nino's (Farina) too slow, get him out of the way." Or Clark about Spence; Stewart about Cevert. No. All three of these gents had and have (in the case of JYS) far too much class to be compared with Vettel. Fangio, AScari, Moss, Surtees, Clark too. Perhaps this applies to many drivers of earlier times? There was no action/superman gung-ho/exploding buildings, fist pumping demonstrations by winners? A generational thing? Just how good are F1 drivers? Are their performances really exceptional. Of course. But this was demonstrated back in 1986, when two lifelong car nuts, historic racers, mechanics, car restorers, were the back-up crew for a competitor in the 1986 Mille Miglia Historic run. They drove the latest Golf GTi. Going up the Futa Pass, suddenly a low red sporstcar came up in the mirror: it was Phil Hill in the 1952 Alfa Romeo Disco Volante. A 2-litre four of 158 bhp and weighing about 660 kg, top speed 220 kmh/137mph. Even today I'd have bet on the GTi to at least have stayed with that old, skinny, hard-tyred Alfa with its drum brakes and wire-wheels. I mean, the Golf's modern chassis, wide tyres, disc brakes, etc. The GTi drivers were obviously no match for an F1 driver, but they really were into cars and had done some historic track work... and Phil Hill was WDC way back in 1961 and in 1986 was 58 years old. The GTi guys told how Hill went passed as if they were standing still. They heard his fast, seamless gear-changes, the smooth cornering. He was out of sight long before the crest. They then saw him way ahead on the serpentine road down below. By the time they got to the level road, they never saw the Alfa again. Ref: the November 1988 edition of Road and Track magazine for Phil Hill's story of driving this car in two Historic Mille Miglia's. From journalists from his day, Piquet snr was known to be a 'ch..ky b....r. In a 1981 interview with a well-known magazine, Nelson said: "If Reutemann was not so cautious and would take more chances he would do much better". Reutemann was then into his tenth season. A few years on, from 1987, and who seemed to be cautious and avoiding risks?